The released version of the GT/Metadata Explorer has a new feature not seen in the beta versions. On the Find Feature tab, you can query any feature in the GIS by selecting the feature type and providing attribute value criteria, specifying a feature’s FID, or performing a query defined in the metadata. Beta versions provided the user with the ability to show Attribute Info, to perform a Connectivity Search, and to perform an Ownership search. The released version provides a new Style Rule Info command which will display all style rules associated with the selected feature, indicate which rules are triggered by the selected feature’s attributes values, and provide a detailed explanation as to why a style rule is selected or rejected. In the example below, a Guy query is performed with several Guy features resulting in the result list. A specific Guy is selected in the results to enable the Attribute Info, Style Rule Info, Connectivity Search, and Ownership Search commands. An additional Feature of the Style Rule Info form is the Explain button. By selecting a style rule from the list, the Explain button. Pressing the Explain button will show a detailed explanation as to why the selected style rule was trigger or rejected. Each clause is evaluated to show if it is True (green) or False (red). The two GUY_TYPE clauses are then OR’ed together, one is TRUE and one is FALSE, so the resulting value is TRUE. The STATE clause is evaluated to TRUE and AND’ed with the result of the two GUY_TYPE clauses being OR’ed together, and is also TRUE. The final result (top of the tree) is TRUE and is why the Style Rule is triggered. A Record View of the Explanation is also available. While the information provided is the same as that shown in the Tree View, the Record View provides a slightly different perspective. GTViewer Version 8.0 provides a new set of Vertex Edit commands to enhance the redline edit capabilities. GTVx has had vertex edit capability for several years in the form of Add New Vertex and Delete Vertex. These two commands plus the new Break at Vertex command are now available in GTViewer and GTVx. The Vertex Edit commands can be very useful when editing redline element such as Lines and Shapes that have vertex points defining their geometries. By using the Select command, a redline element can be selected for edit (it changes to the highlight color and the vertex nodes are shown with handles). The user has always been able to click on a vertex handle and drag the version to a new location. With the new vertex commands, the user can now perform three more types of edits. The Break at Vertex option is new to both GTVx and GTViewer. By right-clicking on a vertex, the Break at Vertex option will be available on the menu. For a line element, two new line elements will be created. The selected vertex will now be a coincident point for the two elements, but not shared by the elements. For a shape element, a line will be created with the starting and ending point at the selected vertex. Graphic Technologies, Inc. (GTI) today announced a new product called the GT/Metadata Explorer. 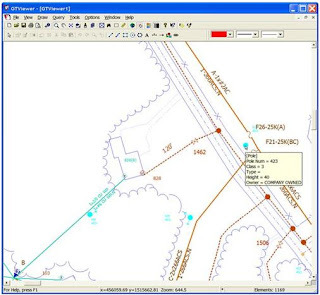 This product is a companion application for Intergraph’s G/Technology GIS System and provides a cache of tools for navigating, reporting, validating, and editing the G/Technology metadata as well as querying, tracing, and reporting the G/Technology GIS data. The GT/Metadata Explorer is ideal for getting a grip on the complexities of the G/Technology metadata, identifying metadata problems, traversing feature connectivity and ownership, and making metadata modifications. The GT/Metadata Explorer’s provides the user with a very easy way to visually traverse the many relationships defined by the G/Technology metadata. For example, a user can “point-and-click” navigate from a Legend definition to a Feature hosted by that Legend, then to the Style Rules associated with the Feature, and finally to the Style Definition used by the Feature’s Style Rule. Another example would be to navigate from a Feature’s definition to the Feature’s Components, then to the Component’s Attributes, and even to the Component Attribute’s Value List. The GT/Metadata Explorer also provides the ability to edit commonly changing parts of the G/Technology metadata including the Style Rules, Style Definitions, and Value List tables. querying on one or more of the feature’s attribute values or by the feature’s Feature Id. The attribute information for the queried feature can be displayed showing all associated database records, and the queried feature’s style rule information can be analyzed to see which rules in the metadata are actually triggered by the feature along with an explanation of why each rule is rejected or accepted. More advanced feature analysis can also be performed with a Connectivity Search which visually traces the feature’s connectivity relationships to analyze how the feature is connected to other features in the GIS data. An Ownership Search is also provided to traverse the parent/child relationships of the queried feature in a visual way. The GT/Metadata Explorer leverages technology GTI developed for its G/Technology Data Extraction tools which export Intergraph’s G/Technology GIS data to other formats. Building on the strengths of these tools, the GT/Metadata Explorer is very easy to use and requires only a connection to the Oracle database to operate; no setup or configuration is required, and support for multiple G/Technology databases is provided. For more information on the GT/Metadata Explorer or other GTI products, please visit http://www.gti-us.com/. The GTViewer .NET Control for Windows version 8.0.0.14 is Available. - FIX - #5550 - Shape with Hole element did not default to the right fill color when defining a ColorValue in the style rules. from 300 milliseconds to 800.
an Event, or do nothing. The ZoomClickAction property has been added. The ZoomClickActionEvent has been added. been handled before raising it. This probablem affected C# apps that did not handle the event. - FIX - #5531 - DataFile returned blank when a .gtx file was opened. - NEW - #5526 - DataFile property added to return the session's parent data file. - NEW - #5444 - PromptDefaultComparison supported in Queries. - NEW - #5446 - Support for Ends With, Contains, and Exact Matches for queries. using a BorderColor style property. occurred. For a UMPC, this does not happen. Related to #5148. - NEW - #5500 - DrawingAllowed Property added. ActivateDrawFreehand, ActivateDrawLine, ActivateDrawArea, and ActivateDrawRectangle will now return false if drawing is not allowed. Zoom when the allowCancel is true or allowInteractive is false. - FIX - #5397 - Magnify Mode could not be activated via the Mode property. - FIX - #5398 - Mode set to None when a file is closed. - NEW - #5400 - SendMouseClick and SendMouseMove method have been added. - CHG - #5401 - New Capture Modes: Capture_Point_With_Zoom, Capture_Point_With_Confirmation_And_Zoom, Capture_GPS_Point_With_Zoom. - FIX - #5402 - UDLS definitions using TrueType fonts were failing. compatible with the PGTV Control. Capture mode is not supported in the GTV Control. - CHG - #5409 - Documentation renamed to GTV-PGTV-Control.doc. will also be accepted for FeatureTooltipMinimumZoom and FeatureTooltipMaximumZoom with GetDataProperty and SetDataProperty. - NEW - #5371 - Non-Category MrSID raster support added. set to the right color with an explicit BackgroundColor entry in the .gtm file. CreateSession methods so that the default setting can be used for the initial view and the view does not have to be refreshed to set the initial raster display. were not working (as defined in [Additional Properties]). will now ignore out of range values. - FIX - #5365 - FixedSymbolScale not returning correct value. FeatureTooltipMinimumZoom, FeatureTooltipMaximumZoom, FeatureToolTipOmitBlankValues properties with SetDataProperty were all returning false. - FIX - #5367 - The FeatureToolTipMaximumScale property was returning the wrong value with GetDataProperty. - FIX - #5368 - FeatureToolTipMinimumScale did not work when set to 0.
return the number of elements last exported. - FIX - #5321 - SetCurrentData always returned false. - FIX - #5344 - The MeasurePrecision data property was not working. properties did not work with GetDataProperty and SetDataProperty. MeasureFactor will return False for values less than or equal to 0 with SetDataProperty. false if set to a value less than 0 with SetDataProperty. - FIX - #5353 - Problem reading Arc and Ellipse elements from a .GTS file. - NEW - #5354 - Upgraded from VS2005 to VS2008. Still supports VS2005 and still uses the .NET Framework 2.0. - NEW - #5355 - Toolbox Icon set to GT Logo. - NEW - #5356 - FileVersion property of GTVControl.dll set to auto-increment. - FIX - #5288 - Capture Line and Area modes were not working correctly. - NEW - #5278 - Basic Printing Functionality: Print, PrintPreview, PringPage Setup. - NEW - #5279 - The CoordinateReadoutPrecision and CoordinateReadout data properties are now available. - FIX - #5280 - EmphasizeSessionGraphics data property did not return True when set. - FIX - #5284 - Raster basepath was not correct when using .gtm or .gts files. The PGTViewer .NET Control for Window Mobile version 8.0.0.4 is available. - NEW - #5541 - Zoom Center action can now be set to Center View, Trigger an Event, or do nothing. The ZoomClickAction property has been added. The ZoomClickActionEvent has been added. - NEW - #5547 - TapAndHoldDelay property added so that the tap and hold delay and be set to a custom value. Default has also been changed from 300 milliseconds to 800. - NEW - #5527 - CurrentFile, SessionFile, and DataFile Properties added to match interface with the desktop version of the control. - NEW - #5445 - PromptDefaultComparison supported in Queries. - NEW - #5447 - Support for Ends With, Contains, and Exact Matches for queries. - FIX - #5459 - Emphasize Session Graphic mode was not graying out shape element using a BorderColor style property. - NEW - #5502 - DrawingAllowed Property added. - FIX - #5399 - Mode set to None when a file is closed. - FIX - #5403 - UDLS definitions using TrueType fonts were failing. - NEW - #5404 - New Capture Modes: Capture_Point_With_Zoom, Capture_Point_With_Confirmation_And_Zoom, Capture_GPS_Point_With_Zoom. was pressed in Capture_GPS_Point mode. - NEW - #5408 - SendMouseClick and SendMouseMove method have been added. - CHG - #5410 - Documentation renamed to GTV-PGTV-Control.doc. - CHG - #5411 - Folder under Start/Program files changed to PGTV Control. Keys, and Point with Zoom when the allowCancel is true or allowInteractive is false. - NEW - #5433 - GetDataRange method added. - NEW - #5435 - ColorTable property added. - FIX - #5436 - GetFontList did not work. - NEW - #5438 - MaxRecordsReturned added to GetDataProperty and SetDataProperty. - CHG - #5439 - Default MaxRecordsReturned changed from 75 to 100. - NEW - #5291 - EmphasizeSessionGraphics property has been added. 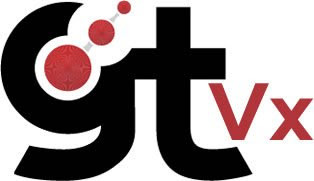 Version 8.0.x.7 of GTVx is available. - FIX - #5564 - Problem introduced with #5442. The Mode 2 for QueryInitialize did not work. - FIX - #5580 - Problem with Feature Tooltips and Point features. Introduced with #5205 and #5206. - FIX - #5553 - Updates to the Feature Tooltips to match the changes made in GTViewer. - NEW - #5554 - Data Monitor Bitmap Selection Tolerance can be adjusted with the DMBitmapSelectionTolerance Data Property. - FIX - #5525 - Raster paths were not resolved correctly when a session file referenced a .gtx file. - FIX - #5518 - DMAddBitmap was not working correctly. - FIX - #5486 - Requery populated the wrong prompt when hidden prompts were used in the query definition. - FIX - #5489 - ElementDeleted event are now stored and send after all of the elements are deleted instead of sending as they are deleted. - CHG - #5492 - Highlighted Text and symbols changed so that it doesn't bold (added in #5002-3). - NEW - #5443 - PromptDefaultComparison supported in Queries. - FIX - #5449 - The Get Range call on a session category with no element would fail, yet the check to determine if a category is out of range and should be skipped was still processed and could possibly overflow. - FIX - #5453 - Better cleanup of bitmap resources when view closes or changes size. - FIX - #5454 - Unreleased memory when invalid filter file was loaded. - FIX - #5455 - Better bitmap resource management for initial screen. - FIX - #5457 - Emphasize Session Graphic mode was not graying out shape element using a BorderColor style property. - NEW - #5473 - GetDisplayFilterString and SetDisplayFilter methods have been added. - FIX - #5475 - Count Options did not disable a mode's sub-options when the mode was not active. - FIX - #5477 - In the Count Options dialog, the Count Highlighted Features in Shape option was available even when no shape was selected. - FIX - #5483 - Better resource management with logo bitmap displayed when no file is open. - NEW - #5484 - Updated to InstallShield 2009. - FIX - #5154 - Adjustments to Style Manager to prevent style gaps at boundary threshold values. - NEW - #5157 - Sorting of Query Result records on all columns and support for clicking on column headers for sorting. - FIX - #5159 - Error message incorrect for Invalid Address Query. - NEW - #5208 - The PointFeatureToleranceDependent and PointFeatureToleranceFixed entries has been added to the Data Property List and Additional Properties section. - NEW - #5209 - The PointFeatureToleranceMode entry has been added to the Data Property List. - NEW - #5210 - PointFeatureTolerance was not working for both fixed and zoom dependent features. - FIX - #5231 - Cancel and Requery buttons would swap places on a resize. - FIX - #5240 - Moving Selected elements did not clear the previous Style object, and if the last object changed a text symbol, the moved element would end up with a different symbol. - CHG - #5271 - Image Preview Tabs in Attribute Info Dialog will now show the image Filename in the title bar. - FIX - #5272 - Column Headers were not being set correctly in the Link tabs in the Attribute Info dialog when more than one records was present. - FIX - #5273 - When Multiple Link records were available for a single Link definition, the grid view was not correctly initialized to display all of the link records. - CHG - #5274 - All Link Tabs in the Attribute Info dialog will now use the records on a row approach even if there is only one record. - FIX - #5275 - Location based detail needed to turn off border mask when locating on the detail. - NEW - #5378 - Add Vertex to Selected Element. - CHG - #5379 - Delete Vertex will now reselect the modified element. - FIX - #5380 - Breaking an element at a vertex did not refresh the view. - CHG - #5381 - Breaking a shape will now create a linestring. The end points of the line string will be the breaking vertex. - FIX - #5387 - The CurrentColor could not be set greater than 5 in a Session file (.gts or .gtx) and can go to 7. - CHG - #5389 - New Product logos are now used. GTViewer version 8.0.x.15 is available. - FIX - #5565 - Problem introduced with #5442. The Mode 2 for QueryInitialize did not work. - FIX - #5576 - Problem with Feature Tooltips and Point features. Introduced with #5205 and #5206. - NEW - #5577 - DefaultGPSReceiverType has been added to the Additional Properties section so that the default GPS receiver type can be specified in the .gtm file. - NEW - #5578 - The GTVx.doc is now delivered with GTViewer as it contains the API specification for GTViewer. - NEW - #5579 - The GTViewer-DOTNET-Interface.doc interface is now delivered with GTViewer. Almost from its beginning, GTViewer has been extendible with External Applications. These External Applications can be for tracing, data collection, importing data, data monitors, etc. GTViewer has been supporting External Applications though a technique called Dependency Injection. An External Application is written as a COM object with an interface to GTViewer; then entries in the .GTM File define the COM objects that can be used with the dataset. GTViewer dynamically adds the External Applications to its menus when the dataset is opened and will launch the External Applications when they are selected. The External Applications are run inside of GTViewer and appear seamlessly integrated. In the past, almost all GTViewer External Applications were written in Visual Basic 6 (VB6). There were a few written in Visual C++ and even some written in Excel (VBA), but the majority were in VB6. Not only is VB6 getting a little long in the tooth (released in 1998), but Visual Basic .NET and the .NET Framework have finally gained acceptance as a development platform and the .NET savvy development crowd is rapidly growing. Strangely enough, GTViewer has been able to support .NET External Applications all along, and GTI had even provided a template .NET application several years ago. However, until Microsoft ended its support for VB6 in March 2008, the idea of using .NET for the development of External Applications had gained little traction. There are many advantages to using Visual Studio .NET when developing GTViewer External Applications. With Visual Studio .NET 2005 or 2008, the development environment alone is enticing enough to move from VB6 to Visual Studio .NET. The .NET Framework also provides many benefits from a developer’s point of view such as the Command Language Runtime, Advanced Memory Management, and a rich set of base classes to work with. GTViewer External Applications written with VB6 were also difficult to debug. The GTViewerAppDebugger control had to be used, and it had its own set of limitations. With Visual Studio .NET, the GTViewerAppDebugger is no longer needed and debugging an External Application has never been simpler. The disadvantages of using Visual Studio .NET when developing GTViewer External Application are also worth mentioning. First, VB6 and VB.NET are similar, but definitely not the same. Some degree of learning is required when moving from one to the other. On the other hand, Visual Studio .NET is not limited to VB.NET and if a developer is more comfortable with C++ or Java, then C# is an alternative to VB.NET. However, the “.NET” part of these languages is still something that will need to be learned even if it is pretty easy to do. The second disadvantage is that the .NET Framework will now be a requirement for the external applications to run. While most machines will have some version of the .NET Framework installed already, the latest versions are usually not. You can, however, target the version of the .NET Framework you want your applications to use and can possibly eliminate this problem by using an older version of the .NET Framework that you know is already installed. In the worst case, you will simply have to deploy an appropriate version of the .NET Framework with your External Applications. I have prepared a fairly detailed document (download here) describing exactly how to extend GTViewer with an External Application using Visual Studio .NET 2005 or 2008. This document goes through the standard items that will be required in all GTViewer External Applications written with .NET and also presents a full example. The example is the Highlight by Phase application which highlights all electric features in the view to a color corresponding to their phase. The example works with GTI standard Electric/Gas demo dataset, but it can be easily modified to work with most electric data. GTViewer version 8.0.x.14 is available. - NEW - #5562 - UseLocateZoomAsMinimum entry has been added to Additional Properties to force Thematic Queries to use the query specified locate zoom as a minimum zoom level. - NEW - #5563 - mode has been added to the base location options with Links. This option will extract the filename from the path in the File attribute. - FIX - #5552 - Feature Tooltips with a blank heading would put an empty line at the beginning of the tooltip. - CHG - #5533 - If FeatureTooltip Entries are longer than 200 characters, they will now automatically be broken into smaller lines for extracts. - NEW - #5534 - Set GPS Reference Point has been added to right mouse menu. - NEW - #5537 - Clear GPS Reference Point has been added to right mouse menu. - NEW - #5538 - Attribute Info dialog box now support sorting rows when column is clicked. - NEW - #5539 - Data Monitor Bitmap Selection Tolerance can be adjusted with the DMBitmapSelectionTolerance Data Property. - NEW - #5542 - ResetFeatureTooltips entry is now supported in the Additional Properties section of the .gtm file and can be used in the addprop.ini file. - CHG - #5521 - If the Keep GPS Indicator in View mode is on and the Locate Single Find option is on, a query with one record will automatically use the Set Ref Point command instead of the Locate command. - FIX - #5522 - DMAddBitmap was not working correctly. - CHG - #5491 - Highlighted Text and symbols changed so that it doesn't bold (added in #5002-3). - FIX - #5485 - Requery populated the wrong prompt when hidden prompts were used in the query definition. - FIX - #5487 - QueryActivate was not populating prompt beyond 3 prompt when Requery was used. - FIX - #5474 - Count Options did not disable a mode's sub-options when the mode was not active. - FIX - #5476 - In the Count Options dialog, the Count Highlighted Features in Shape option was available even when no shape was selected. - FIX - #5478 - Better resource management in Printing. - FIX - #5479 - Fix to problem introduced in 5451 with Text Element pen resource management. - FIX - #5480 - Uninitialized Variables on GetAttributeInfoFromElement was leaving uninitialized variable in TestPointOnElement calls. - FIX - #5481 - Better resource management in Symbol Dialog box. - NEW - #5482 - Updates to the GTViewer.doc document. - NEW - #5442 - PromptDefaultComparison supported in Queries. - FIX - #5448 - The Get Range call on a session category with no element would fail, yet the check to determine if a category is out of range and should be skipped was still processed and could possibly overflow. - FIX - #5450 - Better cleanup of bitmap resources when view closes or changes size. - FIX - #5451 - Better cleanup of pen resources for Text Element drawing. - FIX - #5452 - Unreleased memory when invalid filter file was loaded. - FIX - #5456 - Emphasize Session Graphic mode was not graying out shape element using a BorderColor style property. - FIX - #5461 - Static information used by GPS Reference point was corrupting .gtx files (problem introduced with 5414). - NEW - #5462 - Keep GPS indicator in view switch is automatically turned off when a query form is displayed. - NEW - #5463 - Queries can now have default Display Preset associated with them. - FIX - #5465 - Export to shapefile did not export element without embedded data (problem introduced with 5417). - FIX - #5466 - Export to shapefile did not export group elements if they did not have embedded data. - FIX - #5467 - Export to shapefile was reading elements with an embedded style as an element with embedded data. - NEW - #5470 - Set GPS Reference Point from Query Results has been added. - NEW - #5472 - GetDisplayFilterString and SetDisplayFilter methods have been added to the View object. - NEW - #5417 - Export to Shape will allow any embedded record to be selected. - FIX - #5418 - GTField encoded string are now displayed and exported correctly. - CHG - #5419 - GTViewer will convert GT/Field Table.Attribute names to just the Attribute name when the table is the same as the attribute prefix. Export Data and Export to Shapefile are affected by this change. - CHG - #5423 - GTViewer's Export Data feature will now will consolidate records using the same table but with different attributes. - NEW - #5414 - GPS Reference Point added. - NEW - #5415 - Trimble Simulation session are now saved in the registry. - NEW - #5416 - Installation upgraded to InstallShield 2009. - CHG - #5395 - Update to the new program icons. - FIX - #5386 - Color Combo box was not setting to the session active color. - FIX - #5388 - App Timer for Application Timeout was causing final cleanup from being finished. - FIX - #5340 - Problem with Locate Address processing the locate twice when clicking on the result. - FIX - #5341 - Locating on an Address would some times be zoom in close and some times not for the same feature. - NEW - #5382 - Vertex Edit functionality (Add Vertex, Delete Vertex, Break element at Vertex) has been added. - NEW - #5383 - Feature Tooltip button added to toolbar. - NEW - #5384 - New Product logos are now used. - CHG - #5385 - New End User License Agreement. - NEW - #5318 - DefaultGTM.ini support added. GTI announces the release of GTViewer Version 8.0. Other products in the GTViewer suite including GT/Field, GTData, GTVx, and the GTViewer .NET Controls have also been updated to Version 8.0. GTViewer 8.0 includes a variety of productivity enhancing features and refinements including Feature Tooltips, a GPS Reference Point feature, and advanced Redline edit capabilities. GTVx, the ActiveX Control version of GTViewer, has also been updated to Version 8.0 and keeps pars with GTViewer's new features. GT/Field 8.0 is a dramatic upgrade from previous versions. It now provides a GUI-based, forms-driven Administrative tool for creating and maintaining Data Collection applications. GT/Field is no longer an add-on to GTViewer or Pocket GTViewer, but is instead a stand-alone application designed specifically for the best data collecting experience. Along with the new Administrator, GT/Field provides two versions of the client: GT/Field Pro for Windows laptops and tablets, and GT/Field for Windows Mobile for devices. GT/Data 8.0 provides several new tools as well as many new features for its existing toolset. New tools include GTSumGtg and GTDataSum which provide statistical information about GTViewer data. The GT2CSV tool has also been provided to generate .csv files from GTViewer data on the command-line (as it can be done within GTViewer). A new set of tools has also been provided for more sophisticated Incremental Data Update support and to determine the data differential between two GTViewer datasets. 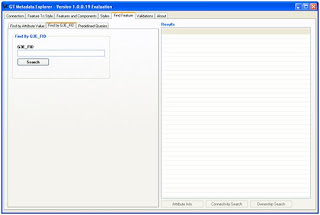 The GTViewer .NET controls have matured in Version 8.0 to become very capable and very powerful development tools; in fact, both GT/Field 8.0 clients were built using the the new GTViewer .NET controls. The .NET Controls can be used with VB.NET or C# (Visual Studio 2005 or 2008) to add GTViewer’s functionality to any .NET application. While similar in concept to the GTViewer ActiveX Control (GTVx), the .NET controls were designed specifically for .NET development and take advantage of many features this development platform offers. The .NET Controls can be used to build custom applications specific to your workflows, or they can be used to integrate GIS capabilities into your existing mobile or desktop applications. In a previous posting, GTI introduced a new tool called the GT/Metadata Explorer, or GTMetaExp for short. This tool was designed specifically to look at Intergraph’s G/Technology Metadata in an Oracle Database. While Toad is another tool for performing this same task, the GTMetaExp is specifically designed to navigate through the metadata without hacking together queries and scripts. 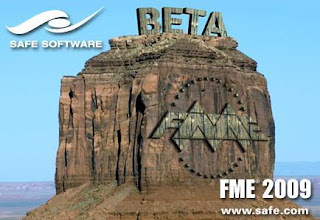 We have been beta testing GTMetaExp over the last few months and have received much positive feedback. We have listened to the beta testers and have added a substantial amount of new functionality to GTMetaExp to make it even more useful. This Part 2 posting on GTMetaExp will cover the new functionality we have added including the Find Feature tab, the Connectivity Search, and the Ownership Search. Since its initial release back in December, GTMetaExp has had a few cosmetic changes. Its main form is now resizable to take advantage of larger screens, a Feature Filter was added to the Features and Components tab to make it easier to locate a feature, and column sort capabilities were added to every List View in the application. Ownership Relationship information was added to the Features and Components tab, and a handful of fixes and other tweaks were made also along the way. This posting is concerned with the new functionality and most of it is located on the Find Feature tab. This new tab does exactly what its name implies; it will find a feature in the GIS database. Technically, this new functionality is moving beyond pure metadata exploring and into data exploring, but since finding a feature in the GIS Database is heavily dependent on the metadata, we haven’t felt it necessary to change the name of the product. Since the initial version, GTMetaExp has been able to produce a Style and Label Rule Usage Report which is also data dependent and not purely exploring the metadata, so the new functionality is not that far removed from our initial intent of the product. The Find Feature tab will let you find a specific feature in the GIS data with 3 different query methods: Find by Attribute Value, Find by G3E_FID, and Find by Predefined Query. Find By Attribute Value is probably the most flexible of the three methods and possibly the most useful. This query method allows you to select a Feature Type that you want to query (from the Features list), then it will present a list of all tabular components associated with that feature. The Primary Tabular Component is selected by default, but you can select any of the available components from the component dropdown list. With a Component selected, the Attribute/Value List View is populated with all available Attributes associated with the feature’s selected component. You can select any attribute in the list and provide a value. When the Search button is pressed, the feature’s component table is searched for all records that match the value provided. 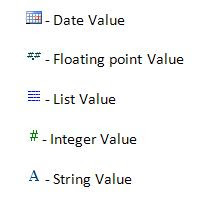 If more than one attribute value is provided, the criteria are ANDed together. The records are also filtered by the feature’s number (G3E_FNO) so that only records belonging to the selected feature will be returned (in case you are searching a shared table like Common or Connectivity). While you can always enter a value, special types like Dates and Lists will have a drop down to assist in entering their value. A Date Type will use a Date Picker and a List will use a ComboBox containing all of the values of the attribute’s associated Pick List. When the Search button is pressed, all records matching the search criteria are shown in the Results List View. Find by G3E_FID is a specialty query method. When you only have a G3E_FID, this query will search all feature tables until a feature is found with the specified G3E_FID value. Enter a G3E_FID in the prompt and press the Search button to perform the query. The Common and Connectivity tables are searched first since they will likely contain the feature; however, if the feature is not found, all feature tables will be searched. The Find Feature Results List View is populated when the Search button is pressed on one of the query tabs. The results can be sorted on any column by clicking the column header. The results can also be copied to the Windows Clipboard. If you select a record in the results, you have three options to choose from: Attribute Info, Connectivity Search, and Ownership Search. The Attribute Info option (also activated by double-clicking on a result record) will display all of the available tabular attribute information for the selected feature. The attribute information is displayed in a GTViewer-style Attribute Info form where each tab is one of the feature’s components. By default, the Attribute Info is shown using the Component and Attribute User Names as they are defined in the metadata. However, the radio buttons across the top of the form can be used to change the display names to their actual database names or a combination of the user name and database names. You can show several Attribute Info forms at the same time so that a comparison can be made between different features. The Copy button is also available to copy the active tab’s contents to the Windows clipboard. The Connectivity Search feature will visually show all features connected to the selected feature in the Query Results. The selected feature and its immediate neighbors are then represented in a simplified graph view. The Connectivity Search is intended to help identify problems in the connectivity by quickly visualizing how the connections are represented in the database. The Connectivity Search can visualize the data in two different ways: Features as Links and Features as Nodes. The visualization method is selected in the lower left corner of the Connectivity Search form and defaults to Features as Links method. The Features as Links method is useful for identifying problems in connectivity records because it represents the connectivity information exactly as it appears in the database, only in a visual format. Connectivity Nodes are shown as pink circles while features are shown between the nodes as blue ellipses (linear features) and orange ellipses (point features). The Features as Nodes visualization method represent only the features as nodes in the graph (blue for linear features and orange for point features) with connectivity records shown as the links between the features. This approach uses fewer nodes in the graphic, but the number of links can be greater as trace steps are added. This view of the data may often be useful when examining connectivity problems as it shows a more real-world view of the data versus the connectivity table representation. Both Connectivity Search Visualization Methods support the Trace Next Step button which will find all features connecting to the features currently in the view. Trace Next Step can be used as long as there are more connecting features. While the graph may quickly become very busy, tools are provided to help manage the view. The Zoom In and Zoom Out buttons will control the current view scale and scroll bars along the view’s bottom and right provide panning capabilities. The Fit All button will fit the entire graph in the view, and the Reset Trace button will return to the initial feature and its immediate neighbors. The Print button will allow the graph to be printed. Hovering the mouse cursor over any node in the graph will display Tooltip information about a node including the feature’s connecting Node values, Fid, FNo, CNo, Cid, and Id. Pressing the Right Mouse Button on a node will give two options: 1) Restart the trace from this Node or 2) Show Attribute Information for feature associated with this Node. The Ownership Search will visualize the selected feature in the Query Results and all features sourced to or owned by the selected feature. The Ownership Search will iterate through the features until no new features can be found. In the Ownership Search results below, the starting feature is always shown in Orange while all of the other features are shown in Blue. The connecting links point to the owner. In the example below, the OH Transformer is the starting feature and is owned by the Pole. The Pole also owns three Secondary Conductors and a Down Guy. The Ownership Search form provides view control with the Zoom In, Zoom Out and Fit All buttons. Panning can be performed with the scroll bars along the bottom and right of the graph view. Like the Connectivity Search, Tooltips will also be shown for each node in the graph and a Right-Mouse Click on a now will provide the option to display Attribute Info for the associated feature. The new capabilities added to GTMetaExp broadens its potential user base. A variety of uses can be found for the Find Feature functionality which extends beyond ability to explore the metadata. GTMetaExp will continue to be in beta until the end of the year, and a beta version will be provided upon request (support@gti-us.com). Version 7.0.x.29 of the PGTV Control is available. - FIX - #5242 - TestElement not setting Filter to Style Mapping. - NEW - #5255 - ExportSingleElementToFile and AddDateElementToFile methods have been added. - NEW - #5262 - DefaultZoomLevel data property added (same as DefaultScale only in zoom level units). - FIX - #5265 - DefaultScale data property was only using integer values instead of floating point values when setting. - FIX - #5266 - InitializeQuery has been updated to match the GTV Control where it will pad prompt lists that are not long enough and truncate lists that are too long. - NEW - #5199 - The PointFeatureToleranceMode entry has been added to the Data Property List. - FIX - #5200 - PointFeatureTolerance was not working for both fixed and zoom dependent features. - FIX - #5204 - The PointFeatureToleranceDependent and PointFeatureToleranceFixed entries has been added to the Data Property List and Additional Properties section. - NEW - #5236 - If -1 is used with ApplyDisplayPreset, it will restore the view to the default settings. - FIX - #5153 - Adjustments to Style Manager to prevent style gaps at boundary threshold values. Version 7.0.x.77 of the GTViewer .NET Control is available. - NEW - #5263 - DefaultZoomLevel data property added (same as DefaultScale only in zoom level units). - FIX - #5264 - DefaultScale data property was only using integer values instead of floating point values when setting. - FIX - #5241 - TestElement not setting Filter to Style Mapping. - FIX - #5246 - BackgroundColor entry in .gtm file was not recognizied when opening a .gtm and the Background color saved in a .gts file was not being set when a .gts file was opened. - FIX - #5252 - GetHighKeyValues did not work with .GTS or .GTM files. - NEW - #5235 - If -1 is used with ApplyDisplayPreset, it will restore the view to the default settings. - FIX - #5223 - Problem with .msi. - FIX - #5217 - Problem with .msi. - NEW - #5213 - FeatureTooltipCancelled event has been added. - FIX - #5215 - DM2_Style properties for SymbolDisplay and LabelDisplay were not working for drawing or highlighting. - FIX - #5216 - DM2_HighlightItem would return FALSE if the label was not in the min/max threshold range. - NEW - #5219 - The GetLastMousePosition method has been added. - FIX - #5201 - If a DM2 Style were added with a fixed size, then all styles added after the fixed style would also have the a fixed style. - FIX - #5202 - The PointFeatureToleranceDependent and PointFeatureToleranceFixed entries has been added to the Data Property List and Additional Properties section. - NEW - #5203 - The DM2_Style class now contains a pointFeatureTolerance property. If the sizeMode is set to 0, then this value is defined in system units; if set to 1, then it is defined in pixels. - FIX - #5196 - PointFeatureTolerance was not working for both fixed and zoom dependent features. - NEW - #5197 - The PointFeatureToleranceMode entry has been added to the Data Property List. - NEW - #5198 - PointFeatureTolerance was not working with SetDataProperty. - NEW - #5189 - GetAttributeInfoForFeature now supports an ORed flag 16 to return all attribute/value pairs even if they are hidden. - NEW - #5160 - Indicator functionality added. - FIX - #5148 - Softbutton status would not be updated until a mouse move event occurred. For a UMPC, this does not happen. - FIX - #5149 - If a dataset did not have any gps configuration, then the dataset would use any previously used dataset's gps configuration. Now, it will reset to the default lat/long settings. Version 7.0.x.34 of GTViewer is available. - FIX - #5230 - Cancel and Requery buttons would swap places on a resize. - FIX - #5239 - Moving Selected elements did not clear the previous Style object, and if the last object changed a text symbol, the moved element would end up with a different symbol. - CHG - #5267 - Image Preview Tabs in Attribute Info Dialog will now show the image Filename in the title bar. - FIX - #5268 - Column Headers were not being set correctly in the Link tabs in the Attribute Info dialog when more than one records was present. - FIX - #5269 - When Multiple Link records were available for a single Link definition, the grid view was not correctly initialized to display all of the link records. - CHG - #5270 - All Link Tabs in the Attribute Info dialog will now use the records on a row approach even if there is only one record. Version 7.0.x.33 of GTViewer is available. - NEW - #5166 - ComputeDistance Method added. - FIX - #5205 - PointFeatureTolerance was not working for both fixed and zoom dependent features. - NEW - #5206 - The PointFeatureToleranceDependent and PointFeatureToleranceFixed entries has been added to the Data Property List and Additional Properties section. - NEW - #5207 - The PointFeatureToleranceMode entry has been added to the Data Property List and Additional Properties Section. I have put together a list of things in GTViewer that I see users wanting to do, but are not aware that they already have the capability to do them. Many of the features in this list are new or relatively new, but some have been available since version 1.0. I hope this list will show you something new that you are unfamiliar with or reacquaint you with an older feature that you might now be able to use. Version 7.0.x.17+. The Feature Tooltip functionality provides tooltips containing a feature’s attribute information by simply hovering the mouse cursor over a feature. The features that have tooltips and the information displayed in the tooltips are specified in the .GTM file. While this feature is relatively simple in what it is does, it can provide a very quick way to see important information with minimal user interaction. For more information on Feature Tooltips, click here. Version 7.0.x.24+. Redline posting added to GTViewer to support GT/Field. However, the need for redline posting is not something unique to GT/Field, so the Post functionality was enabled even if you are not using GT/Field. The Post functionality is configured in the .GTM file and can be used to copy the user’s current session graphics (redlines) to a path on the user’s machine or a network accessible location (via a UNC name). The file that gets copied can be a .gtg file, a .csv files, a set of shapefiles, or an XML file. All redline elements that have been copied are internally marked so that they will not be copied again, or the redlines can be deleted from the user’s session. A variety of other options are available to specify how the copied file will be named and if a redline marker is to be placed on each feature whose edits have been posted (so you will know which feature have been inspected, edited, etc.). Version 5.0.x.8+. GTViewer has had the ability to export session graphics (Redlines) to a set of shapefiles for some time now. If redlines have embedded data (such as those created by GT/Field or other inspection or inventory applications), this data will be added to the shapefile’s .dbf file. This functionality is not new, but it may have been overlooked by users that could benefit from the functionality. It is located under Draw/Export/Export as Shapefile. Version 2.0.x.38+. The Link functionality allows external documents or files specified in a feature’s attribute data to be viewed. This files can be detail drawings, internal worlds, associated documents, etc. The Link functionality has grown considerably since it was introduced and now can automatically show image previews in the Attribute Info dialog and launch URLs. Session Links have also been provided to allow a Link to be placed as a redline symbol that links to an external document or URL. For more information on Links and Session Links, click here. Version 5.0.x.1+. GTViewer supports a special Address Query which is different from the regular locate queries because it can handle street segments with address ranges. If you query for a specific address, it will find the street segment that contains the address number in its range and then will interpolate its location on the segment. Not everyone has street segment data with address ranges, but if you do, this query can be very useful. For more information on the Address query, click here. Version 5.0.x.1+. GTViewer has always been very cognizant of the need to minimize the users required effort to perform a task. The concept of constantly switching modes to zoom in or out, and then to review a feature is very distasteful to GTViewer’s philosophy The Multimode Attribute Info command review attributes on a feature, and can also zoom in, zoom out, or go back to the previous view all in a single mode. The Right Mouse Attribute Info Review is another example of this approach. The user can right mouse in any mode and get a list of features that can be review at that point or any linked files that might be accessible. Since this feature was not available from the beginning, many users may not be aware of it. I have seen many users switch back to Attribute Info mode to review a feature attribute when all they had to do was right click. For more information on the right-click review, click here. Version 5.0.x.22+. A new toolbar button was added to unbind the GPS indicator from the view so that it will not keep setting to view to its location. If a user has the GPS tracking, it is sometimes frustrating if another area needs to be viewed temporarily and the GPS keeps moving the view back to the users physical location. Obviously, the user could turn the GPS tracking off, but for temporary work in another area, a quick click of this toolbar button is all that is needed. When the work in the other area is completed, simply click the button again and the GPS will resume its tracking in the view. Version 7.0.x.25+. Backed by popular demand, the Fit Session Graphics command was added to the toolbar. The Fit Session Graphics functionality has always been available in GTViewer, but not on the toolbar. Many users use the Fit Session Graphics command to return to the area they have been working in (since it will fit only the redlines that have been drawn). Version 5.0.x.4+. GTViewer has always been able to show System coordinates (internal units) and Computed Coordinates (real-world units) on the status bar for the mouse cursor’s current location. The Query/Locates XY command will also use the current coordinate readout settings as its units for the locate. The ability to show the coordinate readout as Latitude and Longitude was added as well as the ability to use the Locate XY command to locate on a Latitude/Longitude coordinate. It does take some configuration before the coordinate readout can use latitude and longitude (because you have to define the coordinate system of your data in the .gtm file), but it provides a new way to look at your data as well as a new way to locate a point in it. The Options/Settings dialog provides the ability to change the Coordinate Readout and the Coordinate Readout Precision. For more information on the Coordinate Readout, click here. Version 2.0.x.4+. Symbol Palettes have provided an easy way to place your standard feature symbols as redlines early on in GTViewer’s life. Symbol Palettes are defined in the .GTM file and can be specified in groups with descriptions and can have predefined, scaled sizes to match existing facilities. This feature is certainly not new to GTViewer, but since it has to be defined in the .GTM file before it can be used, some users may not be aware of it. Version 2.0.x.25+. The Tools/Highlighted Elements to Session feature has been a subtle, yet powerful tool for some time. Simply put, this feature takes any highlighted element and converts it to redline graphics in the session category. By itself, this feature doesn’t do very much. However, if you use a Thematic Query that highlights a particular circuit, or a trace application that highlights trace results, or count features in a polygon with the Feature Counting functionality, you now have something significant that can be converted to session graphics. Once this data is in the session category, it can be shared with other GTViewer users, exported as a .DGN or Shapefiles, posted, edited, printed, etc.